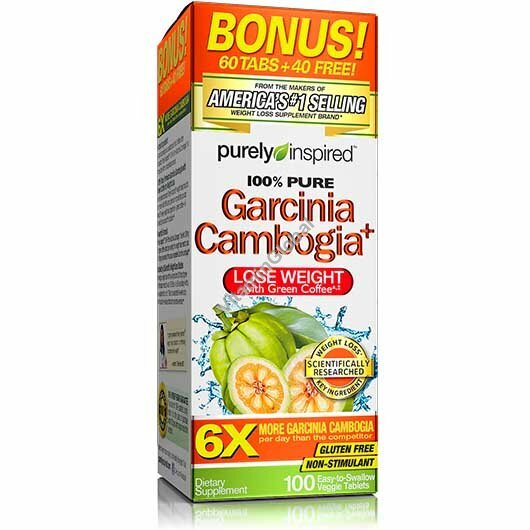 Purely Inspired Garcinia Cambogia+ delivers 200 mg of green coffee extract per serving for weight loss results, plus 1,600 mg per serving of the popular ingredient Garcinia cambogia. Garcinia cambogia is a subtropical fruit. Unlike other products, Purely Inspired weight loss products are made with 100% pure, premium ingredients you can trust. Bonus 60 Tabs + 40 Free! Other Ingredients: Microcrystalline cellulose, dicalcium phosphate dihydrate, hydroxypropylcellulose, croscarmellose sodium, stearic acid, magnesium stearate, silicon dioxide, vegetable-based coating (hypromellose, glycerin), crospovidone. Suggested Use: Take 1 serving (3 easy-to-swallow tablets) twice daily, 30 to 60 minutes before your 2 largest meal. Do not snack between meals or before bed. Combine with diet and exercise. Read the entire label before use and follow directions provided. Warnings: For adults only. Do not use if pregnant or nursing. Consult a doctor before use if you have a medical condition and before starting a diet or exercise program. Keep out of reach of children.